In part 1 of this series, we demonstrated how to build a data pipeline in support of a data lake. We used key AWS services such as Amazon Kinesis Data Streams, Kinesis Data Analytics, Kinesis Data Firehose, and AWS Lambda. In part 2, we discuss how to process and visualize the data by creating a serverless data lake that uses key analytics to create actionable data. 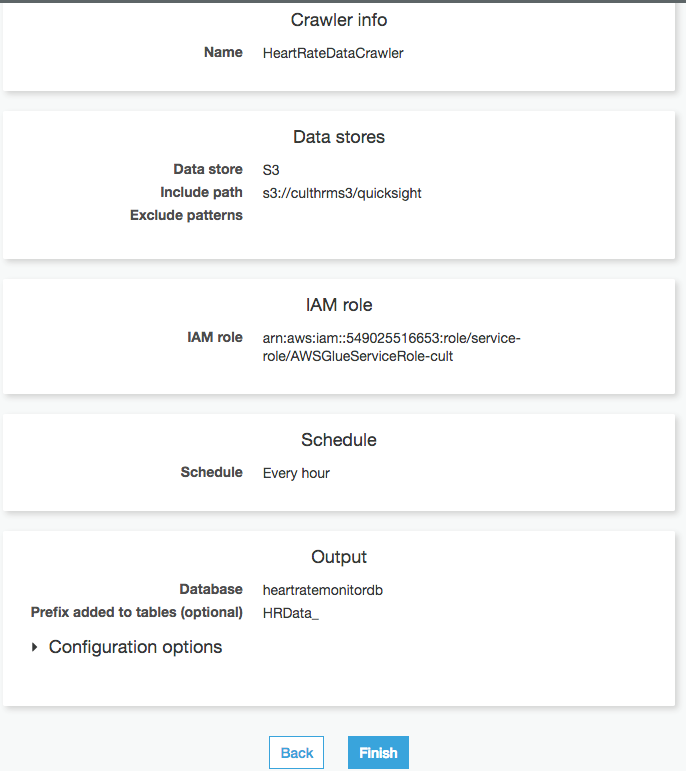 As we discussed in part 1, you can store heart rate data in an Amazon S3 bucket using Kinesis Data Streams. However, storing data in a repository is not enough. You also need to be able to catalog and store the associated metadata related to your repository so that you can extract the meaningful pieces for analytics. For a serverless data lake, you can use AWS Glue, which is a fully managed data catalog and ETL (extract, transform, and load) service. AWS Glue simplifies and automates the difficult and time-consuming tasks of data discovery, conversion, and job scheduling. As you get your AWS Glue Data Catalog data partitioned and compressed for optimal performance, you can use Amazon Athena for the direct query to S3 data. You can then visualize the data using Amazon QuickSight. Amazon S3 now has the raw data stored from the Kinesis process. The first task is to prepare the Data Catalog and identify what data attributes are available to query and analyze. To do this task, you need to create a database in AWS Glue that will hold the table created by the AWS Glue crawler. An AWS Glue crawler scans through the raw data available in an S3 bucket and creates a data table with a Data Catalog. You can add a scheduler to the crawler to run periodically and scan new data as required. For specific steps to create a database and crawler in AWS Glue, see the blog post Build a Data Lake Foundation with AWS Glue and Amazon S3. After configuring the crawler, choose Finish, and then choose Crawler in the navigation bar. Select the crawler that you created, and choose Run crawler. The crawler process can take 20–60 seconds to initiate. It depends on the Data Catalog, and it creates a table in your database as defined during the crawler configuration. In the demonstration table details, our data has three attribute time stamps as value_time, the person’s ID as id, and the heart rate as colvalue. These attributes are identified and listed by the AWS Glue crawler. You can see other information such as the data format (text) and the record count (approx. 15,000 with each record size of 61 bytes). As noted, the data is currently in a JSON format and we haven’t partitioned it. This means that Athena continues to scan more data, which increases the query cost. The best practice is to always partition data and to convert the data into a columnar format like Apache Parquet or Apache ORC. This reduces the amount of data scans while running a query. Having fewer data scans means better query performance at a lower cost. To accomplish this, AWS Glue generates an ETL script for you. You can schedule it to run periodically for your data processing, which removes the necessity for complex code writing. AWS Glue is a managed service that runs on top of a warm Apache Spark cluster that is managed by AWS. You can run your own script in AWS Glue or modify a script provided by AWS Glue that meets your requirements. For examples of how to build a custom script for your solution, see Providing Your Own Custom Scripts in the AWS Glue Developer Guide. In this example configuration, we enabled the job bookmark, which helps AWS Glue maintain state information and prevents the reprocessing of old data. You only want to process new data when rerunning on a scheduled interval. When you choose Finish, AWS Glue generates a Python script. This script processes your data and stores it in a columnar format in the destination S3 bucket specified in the job configuration. If you choose Run Job, it takes time to complete depending on the amount of data and data processing units (DPUs) configured. By default, a job is configured with 10 DPUs, which can be increased. A single DPU provides processing capacity that consists of 4 vCPUs of compute and 16 GB of memory. After the job is complete, inspect your destination S3 bucket, and you will find that your data is now in columnar Parquet format. Partitioning has emerged as an important technique for organizing datasets so that they can be queried efficiently by a variety of big data systems. Data is organized in a hierarchical directory structure based on the distinct values of one or more columns. For information about efficiently processing partitioned datasets using AWS Glue, see the blog post Work with partitioned data in AWS Glue. You can create triggers for your job that run the job periodically to process new data as it is transmitted to your S3 bucket. 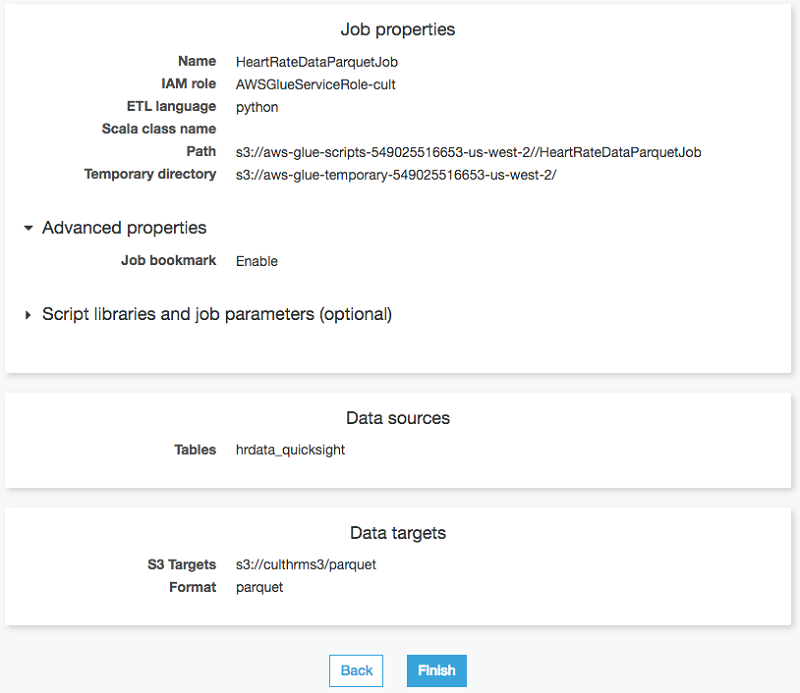 For detailed steps on how to configure a job trigger, see Triggering Jobs in AWS Glue. Choose Finish, and execute the crawler. Explore your database, and you will notice that one more table was created in the Parquet format. You can use this new table for direct queries to reduce costs and to increase the query performance of this demonstration. Because AWS Glue is integrated with Athena, you will find in the Athena console an AWS Glue catalog already available with the table catalog. Fetch 10 rows from Athena in a new Parquet table like you did for the JSON data table in the previous steps. As the following image shows, we fetched the first 10 rows of heartbeat data from a Parquet format table. This same Athena query scanned only 4.99 KB of data compared to 205 KB of data that was scanned in a raw format. Also, there was a significant improvement in query performance in terms of run time. Amazon QuickSight is a data visualization service that you can use to analyze data that has been combined. For more detailed instructions, see the Amazon QuickSight User Guide. The first step in Amazon QuickSight is to create a new Amazon Athena data source. Choose the heartbeat database created in AWS Glue, and then choose the table that was created by the AWS Glue crawler. Choose Import to SPICE for quicker analytics. This option creates a data cache and improves graph loading. All non-database datasets must use SPICE. To learn more about SPICE, see Managing SPICE Capacity. Choose Visualize, and wait for SPICE to import the data to the cache. You can also schedule a periodic refresh so that new data is loaded to SPICE as the data is pipelined to the S3 bucket. When the SPICE import is complete, you can create a visual dashboard easily. The following figure shows graphs displaying the occurrence of heart rate records per device. The first graph is a horizontally stacked bar chart, which shows the percentage of heart rate occurrence per device. In the second graph, you can visualize the heart rate count group to the heart rate device. Processing streaming data at scale is relevant in every industry. Whether you process data from wearables to tackle human health issues or address predictive maintenance in manufacturing centers, AWS can help you simplify your data ingestion and analysis while keeping your overall IT expenditure manageable. In this two-part series, you learned how to ingest streaming data from a heart rate sensor and visualize it in such a way to create actionable insights. The current state of the art available in the big data and machine learning space makes it possible to ingest terabytes and petabytes of data and extract useful and actionable information from that process. 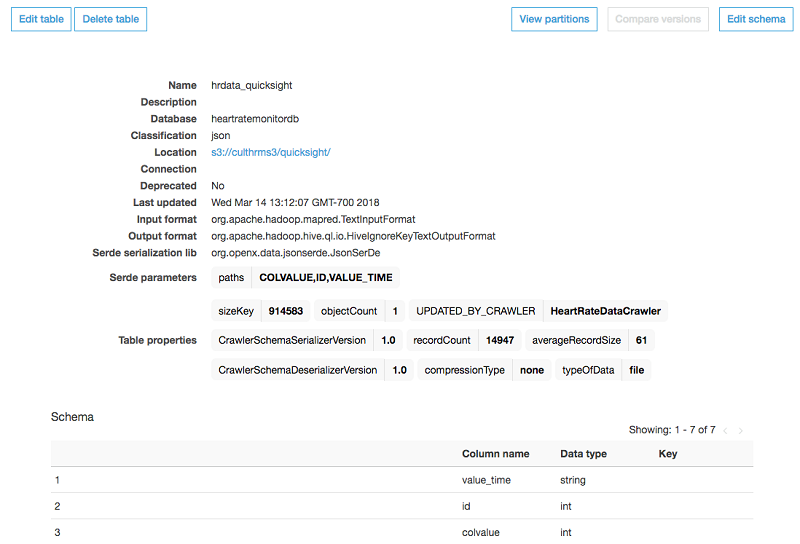 If you found this post useful, be sure to check out Work with partitioned data in AWS Glue, and 10 visualizations to try in Amazon QuickSight with sample data.